There is something about a bed of greens that catches my attention. It’s a great way to add a punch of nutrition. 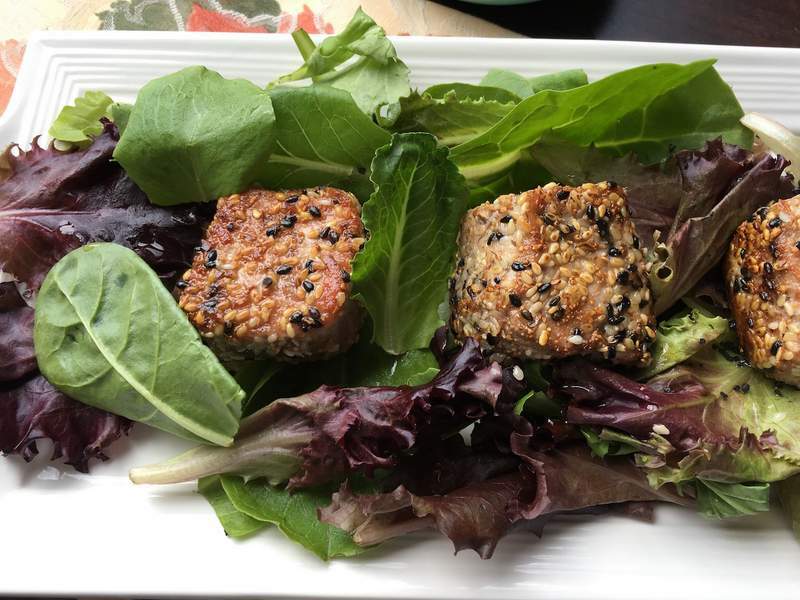 This Seared Sesame Tuna with Mixed Greens is a great dish for the fall. Note ~ Affiliate links are present for your shopping convenience. Purchasing through them MAY result in a small commission for this site. Thanks in advance to all who support our website through their purchases. This healthy salad makes the most of this late (or early) season bounty by pairing these tasty greens with a hearty portion of seared sesame tuna steaks. This salad is substantial enough to serve as a light main dish or it can be paired with blackened broccoli or a seasonal soup for a more substantial meal. For those that need to avoid soy in their diet, you can substitute Coconut Aminos for the soy sauce. If you can have some soy, then I highly recommend Bragg’s Liquid Aminos. To make dressing, add all ingredients to a glass bowl and whisk until thoroughly blended. Taste and add more lime juice to brighten the flavors, if necessary. Season with salt and pepper to taste. Set aside. Add sesame seeds and ground ginger to a large bowl and stir to combine. 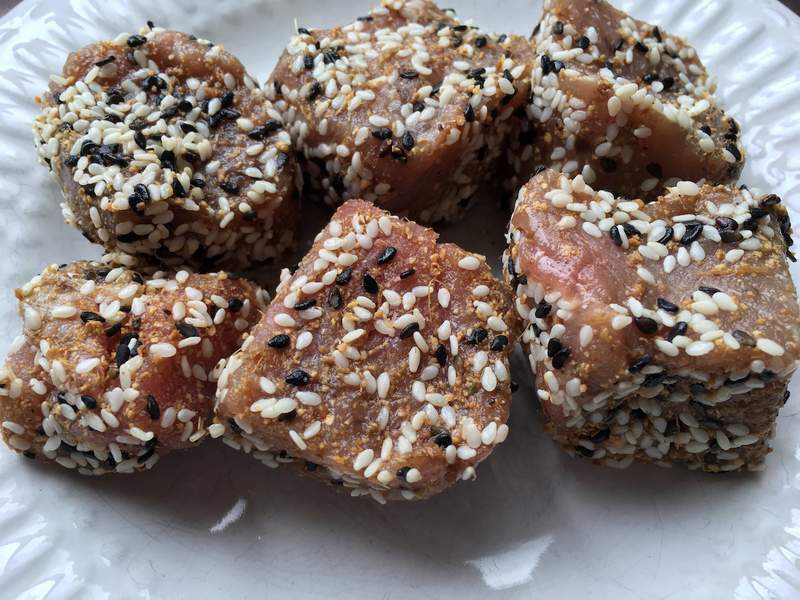 Add chunks of tuna to bowl and toss to coat. Press to make sure seeds adhere to tuna. Heat olive oil in a skillet over high heat. When hot, add coated tuna to pan and flash sear on all sides, approximately 30 seconds per side. Remove from heat and season with salt and pepper, if desired. To serve, add mixed greens to serving plates and top each plate with an equal portion of the seared tuna. Drizzle with dressing. (You can also toss mixed salad greens with dressing before plating, if desired). 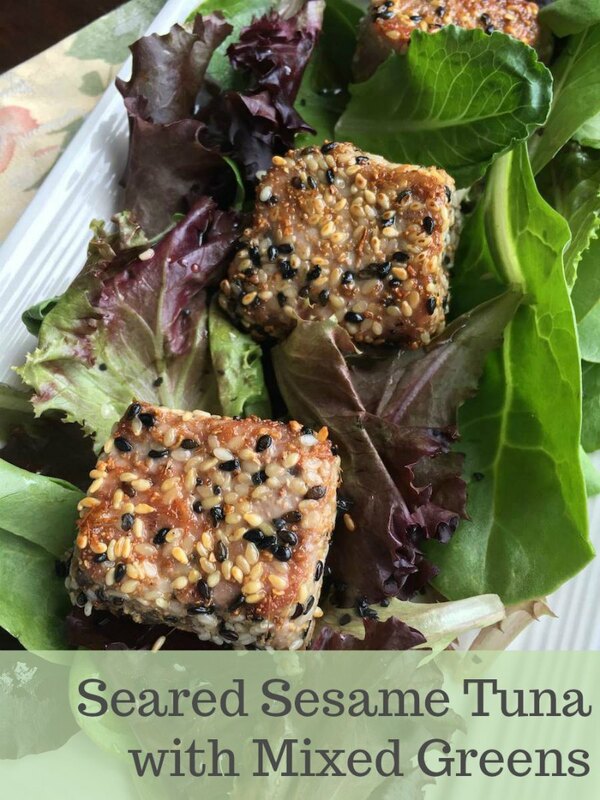 Serve with additional soy sauce and wasabi paste, if desired.